A Merry Christmas from the Indy!! Dan Bryk is the lead story in this week’s Independent Weekly Music section! No, really! And best of all, writer Grayson Currin folds in a charming, even funny interview with Dan and his Christmas Record partner-in-grime/dubstep Erin McGinn. “Dan Bryk just released Christmas Record. It’s his first Christmas album. He insists it will be his last. 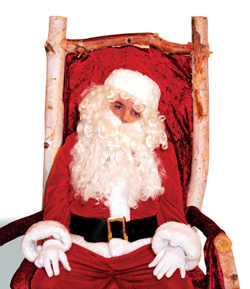 On the back cover, Bryk is dressed up as Santa Claus, his hyperbolic white beard falling all the way to the armrests of an oversized wooden chair. Bryk had his picture taken tonight, too: First, in front of a large, metal Christmas tree, smiling wide-eyed, like a kid whose holiday wait has finally ended. He had the same expression posing in front of a pink plastic pig that wore a red Santa hat. Christmas is this guy’s thing, right? Bryk isn’t kidding. The 30-something songwriter, known for his piano playing and keen observational wit, doesn’t hate Christmas, but he certainly doesn’t like it, either. Perhaps the front cover of Christmas Record tells the story of his antipathy best: A bright, red ornament is shattered across an otherwise pristine white floor. The shards are too big for the ornament to have been thrown. It looks like it was hanging high with seasonal spirit. Then it came crashing down. The hook that held it to the branch is still there. Maybe someone bumped into it? Maybe someone shook the tree? Or maybe it just got tired of trying. And damn, he’s just getting started! Read the whole thing at their site. As if that wasn’t enough, Brian Howe (who also wrote a nifty review of Love Me For Christmas for Pitchfork) gave Christmas Record a sweet album review AND to top it all off, they printed the entire lyrics to Great Adventure flanked by candy canes. It really is a sight to see! Talk about a Christmas present! From all of us (all over the place!!) at Urban Myth!